Many chemical elements of the periodic table can combine to form compounds. However, not all of the elements combine in the same way. It is important to take the individual properties of each element into account before writing the chemical compound that forms from combining them. 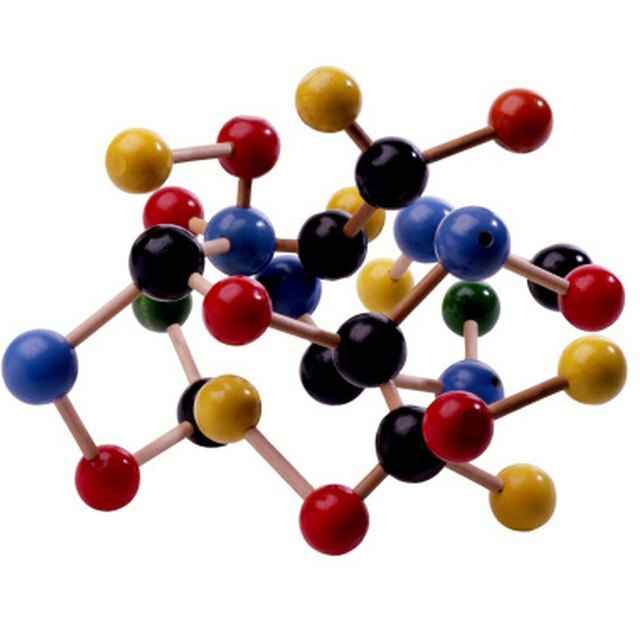 The most common types of compounds are metallic compounds, ionic compounds, and covalent compounds. There is also a distinction between organic and inorganic compounds. It is useful to know how to combine elements to form compounds because the chemical compounds are the basic components of chemistry. Differentiate between the metals, the nonmetals, and the metalloids. The metals are typically on the left and center of the periodic table. They are good conductors of electricity. Copper is one example. The metalloids consist of boron, silicon, geranium, arsenic, antimony, tellurium, and polonium. They possess characteristics of both metals and nonmetals. The nonmetals are on the right side of the periodic table, except for hydrogen. The nonmetals are either gases or brittle solids. They do not conduct electricity very well. An example is nitrogen. Understand how metals form metallic bonds. Metallic bonds describe the free movement of electrons that occur when elements of the same metal combine. Zinc is an example. Know which elements have a high electronegativity. Elements in group 17 have a high electronegativity, which is the desire to pull in electrons of another element when a bond forms. The reason for this is that the elements in group 17 have seven valence electrons. Therefore, only one more electron is needed in order to complete the octet. Know which elements have a low electronegativity. The elements in group 1 have the lowest electronegativity because they only have one electron in their valence shell. Analyze the combination of a metallic element with a nonmetallic element. The result of combining a metal with a nonmetal is an ionic bond. In an ionic bond, the electrons are transferred. Since many of the nonmetals have a high electronegativity, and the metals in groups 1 and 2 have very low electronegativities, such elements combine to form an ionic bond. An example is potassium chloride, or KCl. Analyze the combination of nonmetals. If you combine two or more elements that are nonmetals, then the electrons will not be transferred. Instead, the electrons will be shared, which is what occurs in a covalent bond. An example of a covalent bond is NO2, or nitrogen dioxide. Differentiate between organic and inorganic compounds. Organic compounds contain carbon, and inorganic compounds do not. For example, CH4 is an example of an organic compound, whereas MgBr2 is an example of an inorganic compound. Simon Fraser University: What is a chemical bond? Pesacreta, Mara. "How to Combine Elements to Form Compounds." Sciencing, https://sciencing.com/combine-elements-form-compounds-8744389.html. 13 March 2018.